Study reveals that… 2 out of 3 of your clients may be willing to spend more money with you! Nielsen study reveals that, “Sixty-six percent [2 out of 3] of global respondents say they are willing to pay more for sustainable goods”. There’s a new global trend you need to know about. Sustainability. Sustainable products are making businesses around the world a lot of money. Funeral homes, like yours, have a great opportunity to gain financial benefit from this trend by offering the right products. Simply put, ‘sustainable products’ include those items that help to conserve the environment or reduce its destruction. Think ‘eco-friendly’ or ‘biodegradable’. These products are everywhere in shops and on the internet, but are often missing from the funeral industry. A recent Unilever study found their brands which are offering sustainable products are growing 30% faster than the rest of their businesses. And, not only are people wanting to buy sustainable products, they are also prepared to pay more for them! You need to introduce Return to Sender (RTS) coffins into your range. Developed by world-renowned designer Greg Holdsworth, they represent one of the best ‘sustainable’ coffin alternatives available today. The New York Smithsonian Design Exhibition is held every three years. This prestigious event seeks to show the world’s most innovative designs for the future. The Return to Sender Artisan coffin, was hand-picked by the organisers to be featured in the exhibit. Amazingly, the coffin was on display for six months and then toured with the exhibition around the United States for two more years! Since then, the Artisan has won two more awards: a Sustainable 60 Award and a Designers Institute BEST Design Award. If properly introduced into your coffin selection, The Return to Sender range could prove very profitable for your funeral home. 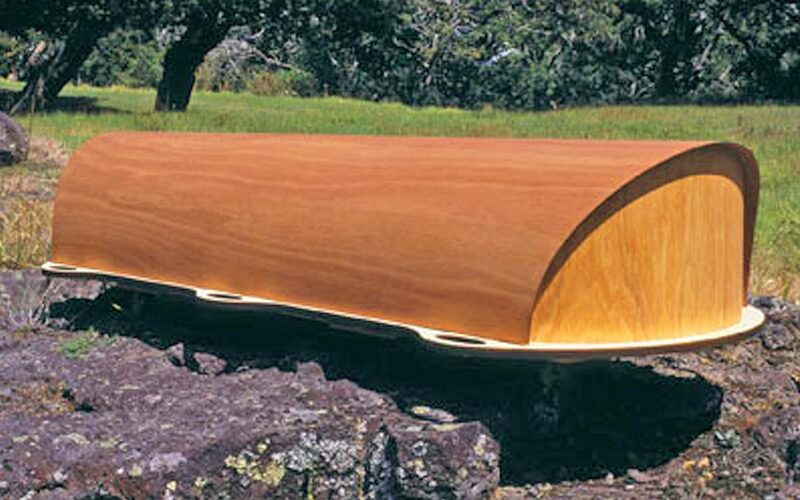 Because, these are some of the best examples of sustainable coffins in Australia, AND as the studies suggest, many people are willing to pay more for sustainable goods. We encourage you to test the RTS coffins. The range is made up of eight coffins, including the gently-curved Baby Crib, for infants. If eight sounds like too many to introduce at once, then start with these four: Artisan; Archetype Rimu; Wayfarer; and Woodland. 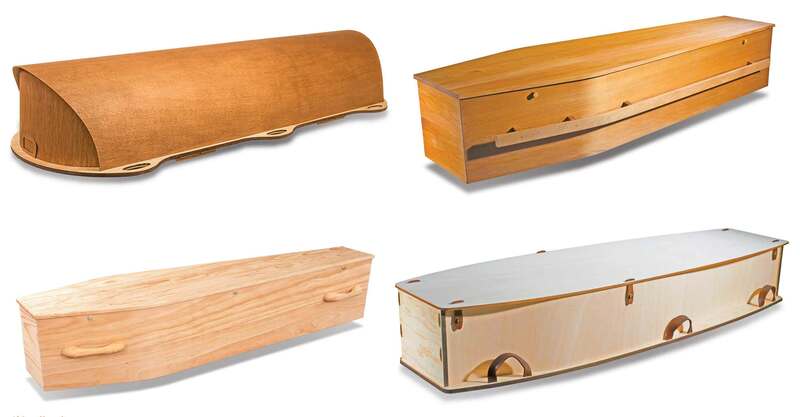 You will have an international, award-winning range featuring arguably the most sustainable coffins available in Australia – if not the world! Sustainably harvested materials such as solid Rimu timber, and beautifully finished pine is used in the construction of the coffins. So, there is no need to use drapery… the natural wood interior is a key feature. You will be able to let families know that, with their purchase, a new tree will be planted on their behalf. Families will also receive a numbered certificate and information on their planted tree. The Artisan, Archetype Rimu and Wayfarer are supplied with genuine Australian wool mattresses, with plant-based ‘eco-plastic’ backings. These are beautifully designed and also discreetly soak up any moisture to prevent leakage. If you, like grief expert Dr Alan Wolfelt, believe in the value of viewings, then the Artisan is the coffin you will be directing families to use. With the lid removed, the Artisan’s low sides allow the family to sit next to their loved one, without having to stand over and peer down ‘into’ the coffin. Families can also choose to buy matching crucifixes too. The crucifixes are made with the same sustainable timber as the coffins and are a cherished memento for families. If you deal with families who ‘shop around’ to compare funeral homes, then you will be able tell them that your funeral home offers the latest sustainable and contemporary coffin options (I bet they won’t hear that from your competitor!). As the studies show, consumers have a desire for sustainable products AND are prepared to pay higher prices for them. Friends, most people reading this won’t bother adding this suggested selection of RTS coffins into their range. They’ll say, “it’s too hard”, or “they’re too much”, or “we don’t have time”. But those industry-leading funeral homes (like yours) that do introduce the RTS range, and educate families about the benefits of the coffins, will have a competitive edge over their competition. And, as the studies suggest, will likely enjoy increased profits. If you want to benefit from the RTS range, call us today on 1300 263 346 to get a copy of a free booklet and to order your four Return to Sender coffins.